Our mains water supply in the UK is carefully treated and monitored to ensure it is safe to drink. However the taste at the tap can vary from household to household, and as our tastes are so individual, many have turned to alternatives like jug filters and bottled water - an expensive and inconvenient alternative. 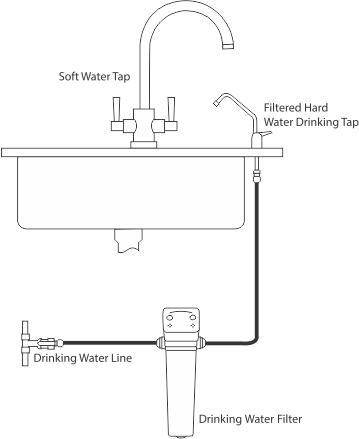 Having a water filter requires very little space and our installers will keep all the parts and fittings neat and tidy under your sink, as shown in the diagram on the right. TwinTec makes having filtered water in your home simple. The installation is carried out by trained engineers. Call us at Humber Water Softeners to arrange a TwinTec drinking water filter for your home. The three stage RO process does not use any chemicals or electricity. Initially tap water is pre-filtered with a dual purpose carbon filter. It is then treated by the reverse osmosis membrane. The membrane is a semi-permeable layer that allows water to pass through but traps the unwanted substances behind. This is the key process that removed virtually all contaminants. Water is then stored in a pressure tank until needed. Finally, it is polished by a carbon filter on its way to a separate drinking tap at the kitchen sink. Sodium, Calcium, Magnesium, Potassium, Iron, Manganese, Aluminium, Ammonium, Copper, Nickel, Zinc, Strontium, Cadmium, Silver, Mercury, Barium, Chromium, Lead, Chloride, Bicarbonate, Nitrate, Fluoride, Silicate, Phosphate, Chromate, Cyanide, Sulfite, Thiosulfate, Ferrocyanide, Bromide, Borate, Sulfate, Arsenic, Selenium, Bacteria, Protozoa, Amoebic Cysts, Giardia, Asbestos, Sediment.